DAPPER KID - a men's fashion and dress blog: What Do You See? 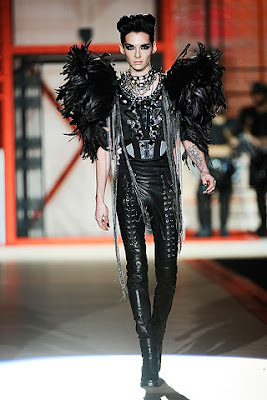 The Fall 2010 collection by brothers Dean and Dan Caten of DSquared opened with a veritable bang. The first look to come thundering down the catwalk was truly resplendent in its glam-meets-goth glory - all black with heavy metal highlights complete with spikes, chains, feathers, black nail polish, eyeliner and even some high heeled boots thrown in for good measure. I smiled when I saw the look. However I smiled even further when I read the reception it received in the fashion media at large. Coverage focused on the obvious gothic glamour of the look and quite eloquently so. From a purely fashion perspective I suppose I see it is a Gareth Pugh meets Ann Demeulemeester vision. Yet at a more personal level, I see something quite different, something entirely missing from current mainstream coverage. 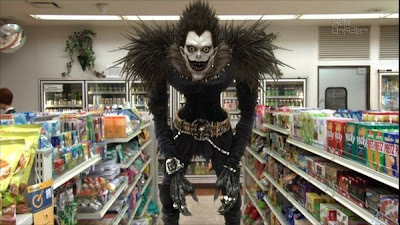 I was shocked when I saw the DSquared collection, because the first thing I saw was Ryuk. 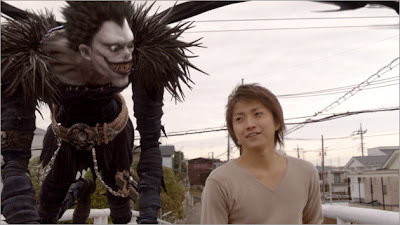 The character features as a Shinigami, a death god, in the manga turned anime turned live action series Death Note. 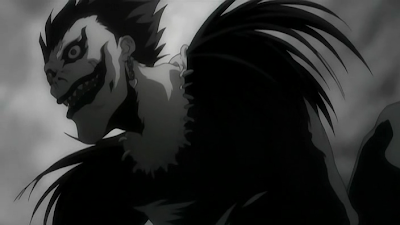 I must admit that I imagined Ryuk as more of a Gareth Pugh wearer, but I suppose Dan and Dean would have it otherwise. & I thought it was an Adam Lambert influence..oh, I love those movies..now if the simplicity of L could take effect..hahaaaa. good eye!! it is very similar! AH you watched Death Note? ?...I loved that series.. Hee I was an "L" fan!! WOW, you're right. I totally see it. And did you know, that model is the lead singer from Tokio Hotel? Bill Klautz from Germany. Quite an interesting connection DK! Haha, exactly what I thought when I saw the first photo!! 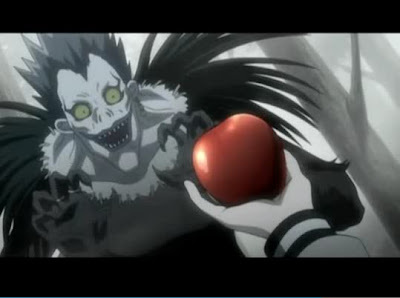 OH MY GOD, that first picture of Ryuk scared the living daylight out of me when I was scrolling down! I actually physically jumped! Hope you had an awesome weekend ! I thought the same thing when I saw this shot! hey thank you for the comment on london-dreamer. sorry its taken so long for me to get back to you. ive had a hectic couple of days. really loving your blog. this is a great collection, very scary though! lol. i immediately thought it was the ambiguous lead singer from tokyo hotel? is it?